Starting on Monday, October 15, 2018, a group of Christians will be meeting in Oklahoma City to participate in a Christ at the Checkpoint (CATC) conference organized by Bethlehem Bible College, a non-denominational Evangelical school located in the West Bank (and with a nonprofit fundraising wing headquartered in Texas). By virtue of the CATC conferences it has held every even-numbered year since 2010, Bethlehem Bible College is a well-known source of anti-Zionist propaganda. Given that this is the first time that Bethlehem Bible College has organized an event on American soil, attendees need to be alerted to some of the more troubling aspects about the CATC. Here are a few things they need to know about CATC conferences and their organizers. 1. The CATC movement capitalizes on habits of self-interrogation and self-criticism of progressive Christians in the West while rewarding the blame-game played by the Palestinian elites. When it comes to self-criticism and self-interrogation, progressive Protestant elites in the West are the world champions. If there is a problem somewhere in the world, progressive Protestants invariably look at how the West and the United States have caused the problem or made it worse. This attitude, which has been particularly pronounced in mainline Protestantism, has become increasingly evident in the progressive wing of Evangelicalism in the United States. These progressive Evangelicals have, like mainline Protestants, embraced Christian self-interrogation and criticism (as opposed to promoting confidence in one’s faith community) as a central component of their faith practice. To a certain extent this is a reasonable attitude to have, because good people should all be interested in assessing the impact of their behavior on the lives of the people around them. A problem arises, however, when people start to put themselves at the center of all of the world’s problems to the extent that it makes it difficult or impossible for them to honestly assess the behavior of other people in the world. 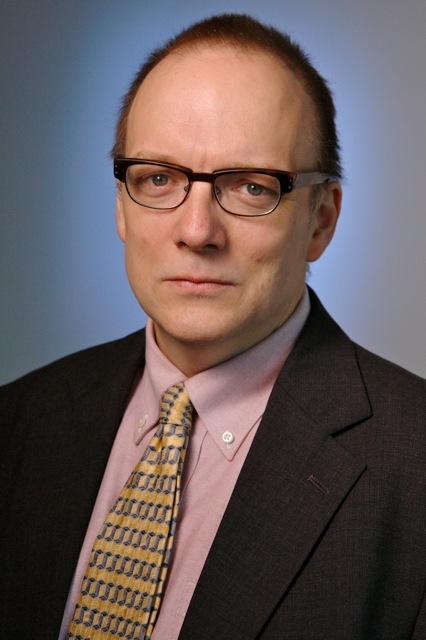 Historian Richard Landes calls this problem “moral narcissism.” People who are afflicted with this worldview, Landes writes, cannot address the misdeeds of non-Westerners even when their bad acts are glaring and profoundly damaging to human welfare. For moral narcissists, “What’s sauce for our goose is not for their gander,” Landes writes. This phenomenon is particularly evident at CATC conferences where Christians afflicted with this moral narcissism are exposed to propaganda from Palestinian elites who refuse to take responsibility for their actions and the suffering they have caused. In this narrative, all the problems and suffering associated with the Arab-Israeli conflict are placed at the feet of Israel, America and the West while the misdeeds of Palestinian leaders are ignored. For example, at the CATC conference that took place earlier this year, Palestinian Christians and their allies condemned American Evangelicals for supporting Donald Trump in the 2016 election and portrayed Israeli Prime Minister Benjamin Netanyahu as an obstacle to peace. And while speakers at the CATC conference condemned these leaders, they offered up unctuous and oily words of praise for the Palestinian Authority and its president Mahmoud Abbas. One conference organizer, Alex Awad (a Palestinian Christian who now lives in the United States), described Trump’s election as a dark cloud brought about by white Evangelicals who put him into office. “They helped elect a president who dashed our hopes as Palestinians,” Awad said the first night of the CATC conference Monday, May 28, 2018. “He brought us a nightmare.” Awad went on to encourage Evangelicals in the audience to increase their efforts to put pressure on Israel to end the occupation and to change American foreign policy in the Middle East. Listeners who hoped that Awad would offer a churchly word of criticism of the Palestinian Authority would have been disappointed. He said nothing about the demonstrable failings of Palestinian elites. The irony is palpable. Christians who are not free to speak their mind in Palestinian society and haven’t been able to vote in a presidential election since 2005 are effectively telling Christians in the U.S. how they should have voted in the 2016 election. Somebody should tell that to the Palestinian Christians speaking at Christ at the Checkpoint Conferences who over the years have exhibited a unilateral support for the Palestinian Authority and its President Mahmoud Abbas. One of the worst offenders is Munir Kakish. 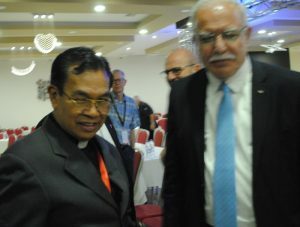 At the 2016 CATC conference, Kakish, president of the Council of Evangelical Churches in the Holy Land, showed his submission to the Palestinian Authority (whose uniformed representatives were sitting in the front row) by declaring that Evangelical churches in the Holy Land “are working on the intellectual and ideological rejection of modern Zionism and racism against our people.” This is the type of propaganda that one would expect from Mahmoud Abbas himself. How is Kakish’s shameless support for Abbas any different than American Evangelical support for Donald Trump? Are these the type of things that an Evangelical who owes his allegiance to Jesus — and no one else — should be saying? Why isn’t Kakish condemning the Palestinian Authority for its corruption, its use of antisemitism as a unifying political agenda, its incitement against Jews, and its policy of silencing critics by throwing them in jail? This is simply ridiculous. Not only have Palestinian elites demonized Israel and Jews to distract rank-and-file Palestinians from their incompetence and corruption, they have also passed laws that make public dissent illegal. In 2017, the PA imposed laws regarding social media. These laws make criticizing the Palestinian Authority a criminal act. One report indicates that these new laws “gives the public prosecutor’s office unlimited powers to surveil Palestinian citizens, intercept their online communications, and arrest them for airing their opinions and political views online.” People who are convicted of using the internet to undermine “social harmony” can be sentenced to 15 years hard labor. This is not what “good government, transparency and accountability” look like. Malki is simply lying and every politically aware Palestinian Christian in the audience knew he was lying. 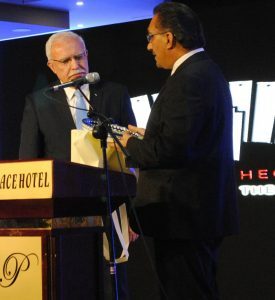 But when he was through with his dishonest speech, Jack Sara president of Bethlehem Bible College gave Malki a commemorative plate for the conference. The plate was decorated with loaves and fishes symbolizing the Feeding of the 5,000. Since when is it a good idea to associate Jesus’s miracles with such dishonest political rhetoric? What we have seen is two duly elected politicians, who are subjected to great scrutiny by the press and legal systems of their respective countries, being given rougher treatment than a corrupt authoritarian regime that spies on and steals from the people it governs and pays salaries to the families of terrorists serving time in Israeli jails. Its leader, Mahmoud Abbas, praises young people who stabbed Jews during the “stabbing intifada” in 2015. This writer has repeatedly raised this issue in writing, and when possible, in direct conversations with Palestinian Christian leaders. One leader associated with the CATC conference has admitted that corruption is a huge problem in the Palestinian Authority and that people speak privately about this and other problems in Palestinian society but that if rank-and-file Palestinians were to speak publicly about this issue, they would end up in jail. This is no exaggeration, because as stated above, PA law gives politicians the ability to throw their critics on the internet into jail. For all their talk about the need to speak truth to power and to speak prophetically on behalf of peace, Palestinian Christians in the West Bank are the last people in the world who can or will hold Palestinian elites accountable for their sins. Instead, they condemn everyone but their own leaders, whom they rely upon for special treatment and protection from Muslim extremists in Palestinian society. It’s one thing for Christians from outside the Middle East to stand in solidarity with Christians associated with Bethlehem Bible College; it is another thing altogether for Christians to affirm the distorted narrative offered by this institution. But that is what Bishop Efraim Tendero from the World Evangelical Alliance did with his appearance and comments at CATC this past spring. He did exactly what he warned his audience not to do — he put his identity as an Evangelical into the service of a corrupt and worldly political agenda. 2. The CATC movement subjects the Hebrew Scriptures, Judaism, Israel, Zionism and Christians who support Israel to intense scrutiny while remaining silent about the Koran and other aspects of Islam that promote violence against Jews and Israel. To a certain extent, it is unavoidable that Alqassis would have a difficult time with the Old Testament given that it includes regular affirmation of God’s promises to the Jewish people. Such passages are going to be difficult for some Palestinians to accept, particularly in light of the antisemitism that permeates Palestinian society. But it is interesting (and telling) that Alqassis and other speakers at CATC conferences have said nary a word about a religious text — the Koran — that explicitly portrays Christians as a legitimate target of violence and oppression by Muslims. The Koran does to Christians and Jews what Alqassis falsely accuses the Hebrew scriptures of doing and yet Alqassis doesn’t say a word. 3. The CATC promotes a distorted and inaccurate view of history and events in the Holy Land. In particular, speakers at CATC conferences work assiduously to downplay the issue of antisemitism in Palestinian society. The fact is that the Grand Mufti of Jerusalem, Haj Amin Al Husseini, one of the founding fathers of Palestinian nationalism, was one of the world’s worst purveyors of antisemitism during the 1920s, 30s and 40s and would have likely been hanged for crimes against humanity for his involvement in the Holocaust if he had not escaped to France and found refuge in Egypt after World War II. Whether the organizers of the CATC want to admit it or not, Jew-hatred is a problem in Palestinian society. No one truly intent on promoting peace in the Holy Land can ignore this issue. Sadly, a refusal to address antisemitism in Palestinian society manifested itself at the 2016 CATC conference during a video interview with Palestinian scholar Mustafa Abu Sway. Sway, who was interviewed in a video by conference organizer Munther Isaac, declared that efforts to highlight antisemitism in Palestinian society were merely the work of pro-Israel spin doctors. Sway’s assertion that Palestinian leaders never, never, never taught children to hate is simply put, a lie. And Sway’s defense of Mahmoud Abbas as a peace partner who has chosen the way of peace and non-violence ignores the PA President’s campaign of incitement against Israeli Jews. There is a mountain of evidence demonstrating how Palestinian leaders use Jew hatred as a unifying political agenda. Palestinian television shows regularly encourage children to hate Jews. Antisemitic incitement is a huge problem in Palestinian society. The Christ at the Checkpoint movement and its parent organization, Bethlehem Bible College, portray themselves as part of a larger peace movement in the Holy Land. Unfortunately, CATC conferences are a place where Western Christians are misinformed (sometimes willingly) by Palestinian Christians.